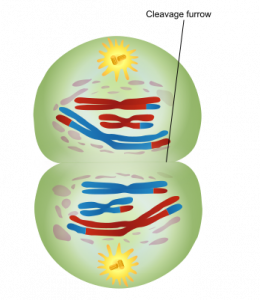 Meiosis is the process by which gametes are made. In this process, we begin with a 4n cell (double the normal amount of DNA), and we will end up with 4 non-identical haploid (n) daughter gametes, after 2 divisions. There are 6 stages within each of the divisions; Prophase, Prometaphase, Metaphase, Anaphase, Telophase and Cytokinesis. 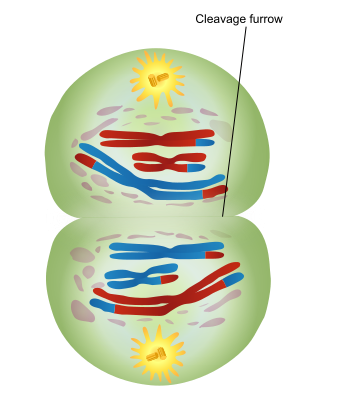 In this article, we will look at all the stages of meiosis in addition to its significance in diseases. Firstly the nuclear envelope disintegrates and the chromosomes begin to condense. Spindle fibres appear which will be important for successful division of the chromosomes. 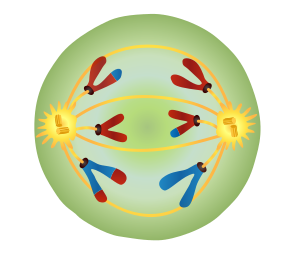 Now the spindle fibres attach to the chromosomes at a points along the chromosomes called centromeres. While this is happening the chromosomes continue to condense. Fig 2 – Image of prometaphase I. 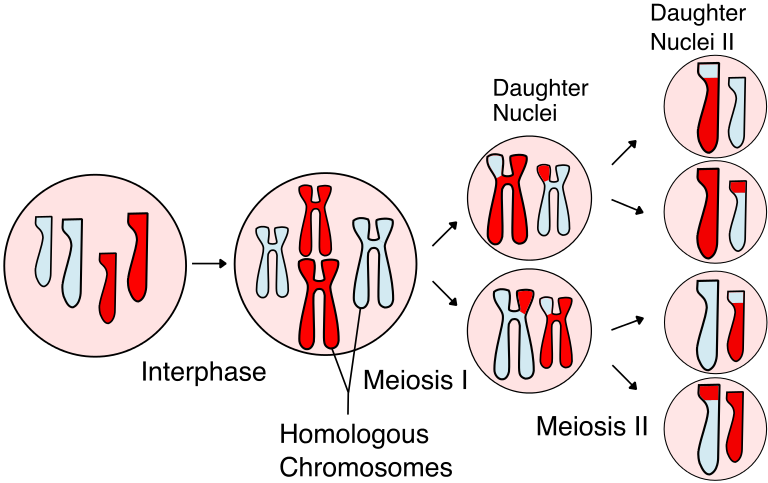 Next, homologous (Maternal and Paternal versions of the same chromosome) chromosomes align along the equator of the cell and a process called random assortment occurs here – this is when maternal and paternal chromosomes line up randomly align themselves on either side of the equator, this leads to genetic diversity among offspring. To further increase the genetic diversity, homologous chromosomes exchange parts of themselves such that one chromosome contains both maternal and paternal DNA. This process is known as crossing over, and the points at which this occurs on a chromosome are refund to as chiasmata. 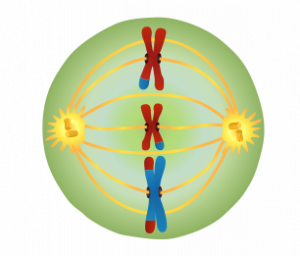 Here each of the homologous chromosomes get pulled towards opposite poles of the cell as the spindle fibres retract to divide the DNA between the two cells which will be formed. Fig 4 – Image of Anaphase I. 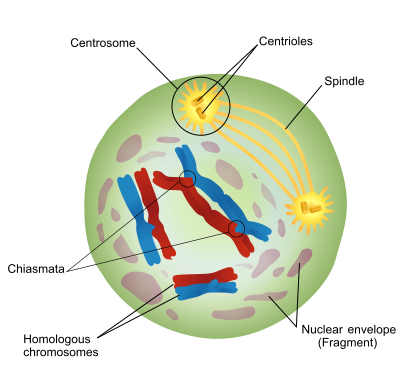 During telophase I, the nuclear envelope reforms and spindle fibres disappear. 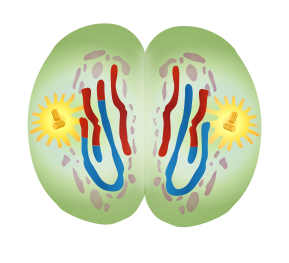 In Cytokinesis I, the cytoplasm and cell divides resulting in 2 non-identical diploid (2n) daughter cells. These stages are identical to their counterparts in meiosis I. Now chromosomes line up in single file along the equator of the cell. This is in contrast to Metaphase I where chromosomes lined up in homologous pairs. Next, sister chromatids (produced when the chromosomes split) are pulled to opposite poles of the equator. Fig 7 – Image of Anaphase II. This is the same as Telophase I. Again, the cytoplasm and cell divides producing 2 non-identical haploid daughter cells, but as this is happening in both cells produced by meiosis I, the net product is 4 non-identical haploid daughter cells. There are many conditions associated with errors in meosis, such as aneuploidy where there is the loss or gain of whole chromosomes. 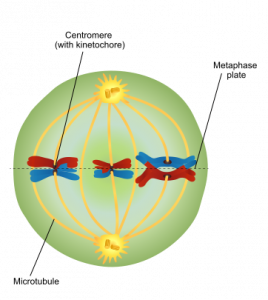 Non-disjunction can also occur, where chromosomes do not separate during anaphase and either chromosomes or chromatids move to the same pole of the cell. 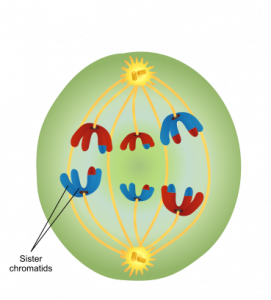 Finally, Anaphase lag can occur where chromosomes are left behind due to defects in the spindle fibres or attachment to chromosomes. These can lead to clinical conditions like Edwards, Down, Turner, and Patau Syndromes. For example, Edwards Syndrome is a trisomy syndrome (a condition caused by having three of the same chromosome) where individuals have three copies of chromosomes 18. 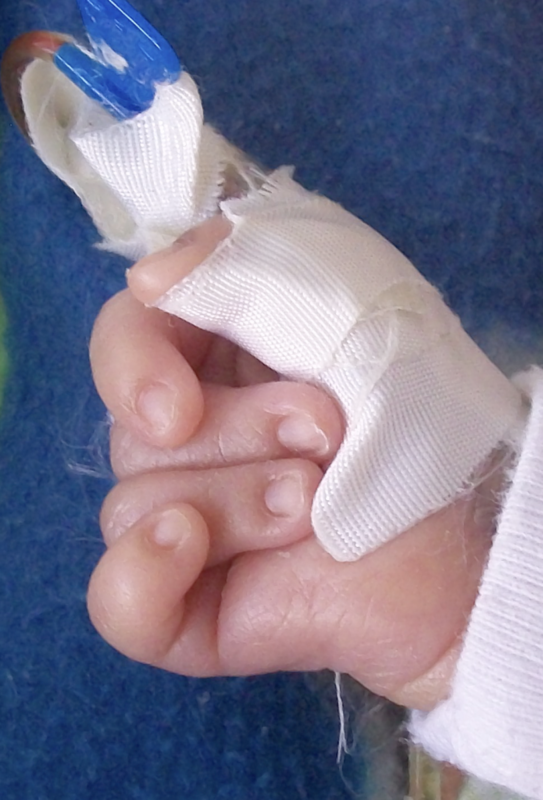 Characteristic features of this condition are small lower jaw, prominent occiput, “rocker bottom” feet, low set ears, and overlapping fingers. A normal life span for those with this condition is 5-15 days. Fig 9 – Image of overlapping fingers, a common symptom in Edward’s Syndrome. Which of the following occurs during prophase 1? Which of the following occurs during prometaphase 1? Which of the following occurs during metaphase 1? Which of the following occurs during anaphase 1? Which of the following does NOT occur during telophase 1? What is the product of cytokinesis 2?